Alia Al-Saji is associate professor of Philosophy at McGill University. Her philosophical research brings together and critically engages 20th century phenomenology and French philosophy, on the one hand, and contemporary critical race and feminist theories, on the other. Running through her research is an abiding concern for the themes of time and embodiment, the intersection of which Professor Al-Saji seeks to philosophically elaborate. 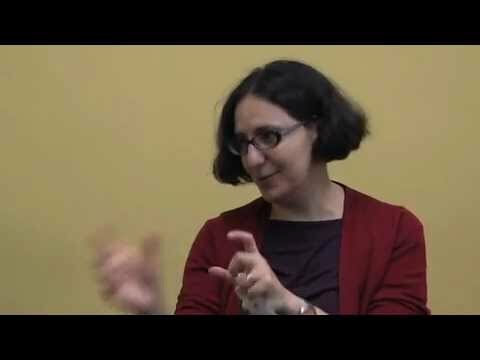 While her doctoral research at Emory University, completed in 2002, focused on the German phenomenology of Edmund Husserl, Professor Al-Saji has since published extensively in the areas of French phenomenology and philosophy - on the philosophies of Henri Bergson and Maurice Merleau-Ponty in particular - as well as in the field of feminist theory. She has published in journals such as Continental Philosophy Review, Philosophy and Social Criticism, Research in Phenomenology, Southern Journal of Philosophy, and the Journal of the British Society for Phenomenology. In 2009, Professor Al-Saji was awarded a fellowship at the Camargo Foundation in Cassis, France to carry out her research, and since 2009, she has been a fellow at the Institute for the Public Life of Arts and Ideas at McGill University. Professor Al-Saji was elected to the executive committee of the Society for Phenomenology and Existential Philosophy (SPEP), the second largest philosophical association in North America in 2009. She is currently a co-editor of the Symposia on Gender, Race and Philosophy, and the Feminist Philosophy section editor of Philosophy Compass. Professor Al-Saji's research traces two interrelated trajectories. The first trajectory of her research explores questions of embodiment, memory and intersubjectivity in terms both of affectivity and perception. The second trajectory of Professor Al-Saji's research develops a phenomenology of what has been called "cultural racism". In this vein, she offers a feminist analysis of representations of Muslim women in contemporary Western contexts by questioning the ways in which race and gender are at play in attitudes toward the Muslim headscarf or "veil". Her recent articles have dealt with the "the French headscarf affair" and the use of a rhetoric of freedom to justify the U.S.-led war on Afghanistan. While at the IAS in Durham, Professor Al-Saji will be completing her book manuscript entitled Bodies and Memories: Bergson, Merleau-Ponty, and the time of difference. This manuscript not only presents a sustained argument for thinking inter-subjectivity temporally, but also brings together her two research trajectories by asking after the ethics and politics of memory and perception. In this vein, the project draws on phenomenological, feminist and critical-race analyses of objectifying-specifically racializing-ways of seeing in order to understand their limits and the possibilities for "seeing differently". This paper asks how perception becomes racializing and seeks the means for its critical interruption. Professor Al-Saji's aim is twofold: first, to understand the recalcitrant and limitative temporal structure of racializing habits of seeing, a structure that restricts their responsivity and improvisational openness. While racializing perception can be understood to build on the intentionality and habituality of all perception (as Linda Martín Alcoff has shown), its distinctive intransigence and de-humanization call for further phenomenological study. In this paper, Professor Al-Saji argues that racializing perception is both more and less than habitual perception: more in its representational over-determination, less in its affective closure to difference and change. Drawing on the phenomenologies of Maurice Merleau-Ponty and Frantz Fanon, she will show how this perception is reductive and naturalizing; it constitutes racialized bodies as bodies that cannot be seen otherwise. As a counterweight to the closure of racializing seeing, the second aim of this paper is to uncover resources within the temporality of perception for a critical awareness and destabilization of racializing habit. Reading Henri Bergson and Merleau-Ponty in dialogue with Iris Marion Young and race-critical feminism, Professor Al-Saji finds in hesitation the phenomenological moment when racializing habits of seeing can be internally fractured. Hesitation, she claims, can make visible the exclusionary logic of racializing and objectifying perception, countering its affective rigidity and opening it to critical transformation. Hesitation thus opens the possibility for perception to become at once critically watchful and ethically responsive. Al-Saji, A. (2014) 'A Phenomenology of Hesitation: Interrupting Racializing Habits of Seeing' in Emily S. Lee, E.S (ed) Phenomenology, Embodiment, and Race. New York: Suny Press, pp.133-172. In this paper,1 I explore some of the temporal structures of racialized experience – what I call racialized time. I draw on the Martiniquan philosopher and psychiatrist Frantz Fanon, in particular his book ‘Black Skin, White Masks,’ in order to ask how racism can be understood as a social pathology which, when internalized or ‘epidermalized,’ may result in aberrations of affect, embodiment and agency that are temporally lived. In this regard, I analyze the racialized experience of coming ‘too late’ to a world predetermined in advance and the distorted relation to possibility – the limitation of playfulness and imaginative variability – that defines this sense of lateness. I argue that the racialization of the past plays a structuring role in such experience. Racialization is not limited to the present, but also colonizes and reconfigures the past, splitting it into a duality of times: one open and civilizational, the other closed, anachronistic and racialized. To understand this colonial construction of the past, I draw on the work of Latin American thinker Aníbal Quijano.